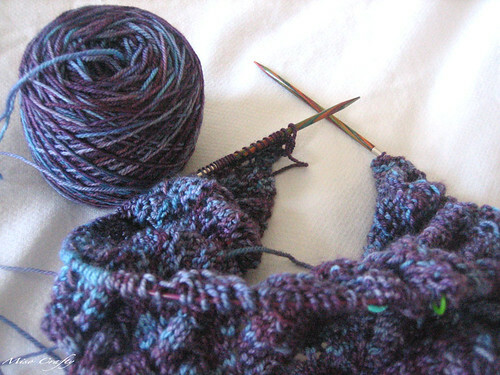 My third project for the push for 12 in 2011: the Ishbel shawl. I had actually started this project last summer, but using a different yarn. I had started out using JaggerSpun Zephyr Wool-Silk in a beautiful emerald green. I had envisioned wearing the shawl with a sunny yellow dress to a wedding that Brett and I were invited to. Obviously that plan didn't pan out. Before I had even gotten to the lace part of the shawl I decided that I hated the fabric that I was getting with the JaggerSpun and had immediately set it aside and cast on for another project instead. The JaggerSpun was producing a really delicate fabric, it was seriously lighter than air. As wonderful as that would have been to have draped around the neck, I could totally see myself somehow damaging and/or snagging such a dainty piece of art. I like my scarves to have a bit of heft to them, and this yarn definitely wasn't producing anything close to it. I had actually discovered earlier today on Ravelry that even though the JaggerSpun was classified as a lace weight, the "Zephyr" part of the name actually indicates that the yarn is finer than cobweb and could technically be considered as "thread". Eep. So this project sat in my knitting basket until a few months ago when I decided to rip it (I needed the needles), and had only decided to try the pattern again when the idea of the 12 in 2011 came around. Don't ask the reasoning behind this (cause seriously, there really isn't any), but I decided to use the Malabrigo sock yarn that I had in my stash because it was already wound into a cake. Rather than taking the time to re-skein the yarn, I thought it would just be easier to knit it (I told you there was no reasoning behind this!). I've never used Malabrigo before, even though I have several skeins of the stuff in my stash. So far it has been wonderful to work with, as in it is soooo incredibly soft and I can't wait to wrap this shawl around my neck. Yet I don't think I would ever use this yarn for its' intended purpose, which is for socks. I find the yarn to be a bit too skinny for my tastes and prefer my sock yarns to have a little more weight to it. The shawl itself is knitting up quite fast. I'm sure it would knit up even faster if I would just devote all my knitting time to one project rather than two. And if I wasn't constantly forgetting to yarn over every second right side row. I'm starting to realize that me and lace patterns kinda don't mix. Lace involves a lot of yarn overs and counting. I have a tendency to get distracted really easily. These two factors don't go hand in hand that well and will result in a lot of tinking back and having to knit a row twice. Even with all the tinking and re-knitting, and the fact that I have 5 sections to go, I'm really hoping to have this project finished before the month is over. Hmmm...a finished shawl in a week and a bit? Yeah, totally do-able! With that said, I'm off to go knit!